Not many people have heard of Charles Montagu Doughty, the great desert explorer and a contemporary of the equally famous Sir Richard Burton. In 1876 the young Charles Doughty set out to cross the interior of the Arabian Peninsula. 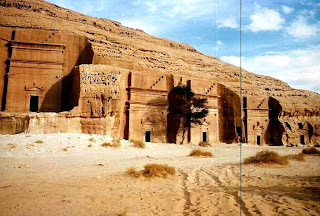 His goal was the "lost" Nabatean city of Madain Saleh the magnificent sister city to Petra in Jordan. Several years of his life were spent in what were later called his "wanderings": explorations of a terrain little known to Europeans, the discovery of the remains of the sought-for city and detailed accounts of what he discovered there, with particular attention paid to the local geology. I've noticed that the BBC 2 documentary, 'The Frankincense Trail' with the embrassingly naive, Kate Humble, looks as if she is to visit this same spot in the northern desert of Saudi Arabia. I was once lucky to see this almost thirty years ago, while following the path of T.E Lawrence and the abandoned remains of the Hejaz railway; carrying a well-thumbed copy of the 'Seven Pillars of Wisdom'. Thirty years ago Saudi Arabia was even more closed than it is today and while unlike Burton or Doughty, the risk of discovery didn't carry the automatic risk of execution, simply getting to the site, even with the permission of the Minister of the Interior, was a struggle, on account of many local Bedouin police being quite unable to read, the tense situation with Israel and the unnerving habit of checkpoint guards of wanting to confiscate the travel authorisation document. 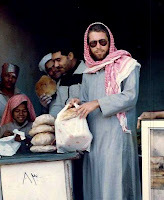 The only means of travelling around at the time was in rough local disguise, camping out in the desert to avoid attention. Today, with the remains of the city now a world heritage site, it's a little easier if the Saudis will grant a visa and you don't have to grow a beard either! There is a third Nabatean city along the spice route as well but this one is almost completely unexcavated and I forget its name. I stumbled across it mountain biking in Jordan about ten years ago. What the BBC's Kate Humble will make of it all is anyone's guess and I would be surprised if she spots the old railway engines from the First World War, gathering dust in the remains of the Turkish garrison station.